Dessert can be a lot healthier if you make it out of vegetables. 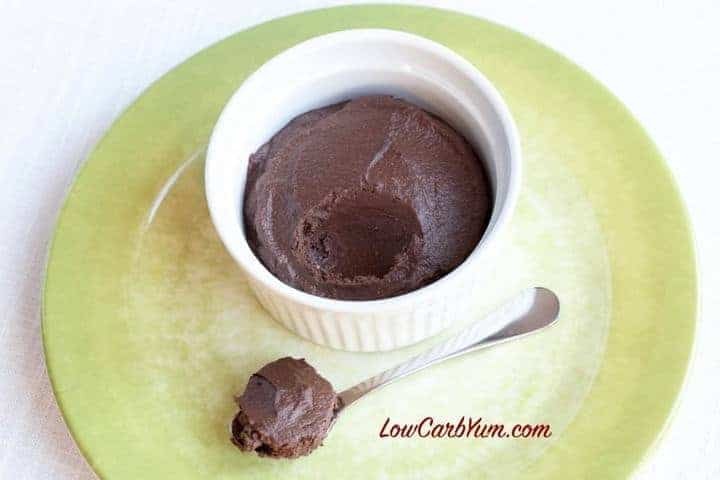 Try a healthy serving of low carb cauliflower chocolate pudding. It’s very tasty! This year, I’ve been trying to make my desserts a lot healthier. How would you feel about a dessert that contains a full serving of vegetable in it? Yup. 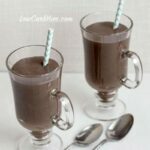 I thought I’d try making a low carb cauliflower chocolate pudding. And, guess what? It tastes pretty darn good! I’m sure I’m going to get some grossed out faces when I post this recipe. But, seriously, you need to give it a try. At first I made it with all stevia liquid sweetener. However, it tastes much better made with Swerve and a few drops of stevia mixed in to get the sweetness just right. I admit that cauliflower has a stinky smell when it’s cooked. My husband always complains when I cook cauliflower or broccoli. It’s only something that’s released during cooking. The taste of cooked cauliflower is pretty bland. That’s why it works so well in so many types of recipes! 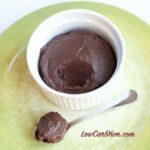 I saw a recipe for low carb cauliflower brownies and thought why not make a low carb cauliflower chocolate pudding? It looks like the cauliflower shortage has ended as I’m able to find it in the stores now for a reasonable price. It has become so popular that stock is usually low. Even the amount of frozen cauliflower seems to be getting low in the grocery stores. 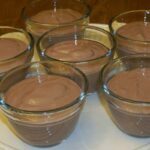 It’s super simple to whip up this low carb cauliflower chocolate pudding. You’ll just need to steam, boil, or microwave the cauliflower until soft. Then, using a high speed blender or food processor, puree it until it’s nice and smooth. Then, you’ll add in some cocoa powder, gelatin, heavy cream, and sweetener to taste. I like blending two types of sweetener because I find it gives the best taste. To show you just how easy it is to make, I put together a video showing how I made my low carb cauliflower chocolate pudding. Who ever thought cauliflower would make such a yummy dessert? Dessert can be a lot healthier if you make it out of vegetables. 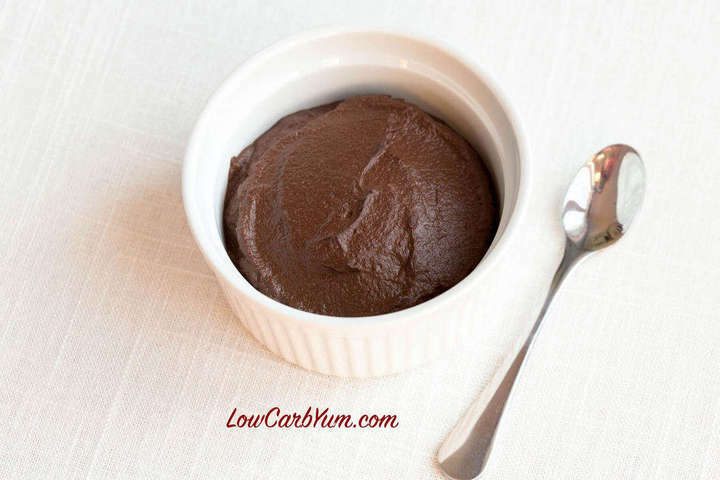 Try a healthy serving of low carb cauliflower chocolate pudding. It's very tasty! 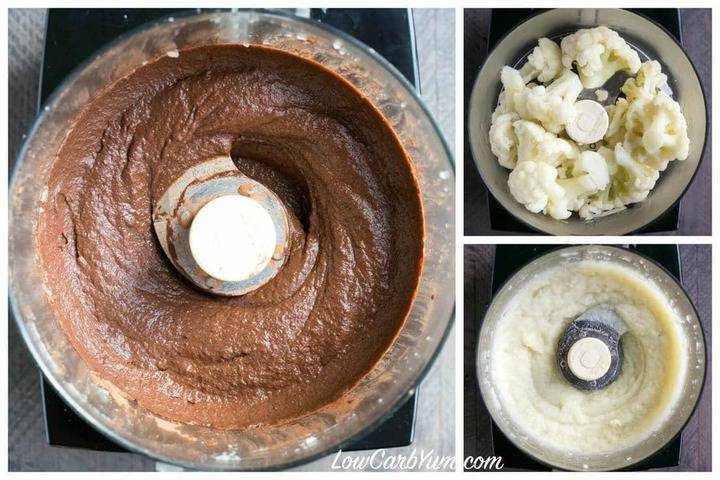 In high speed blender or food processor, puree cauliflower. Puree in gelatin, cocoa, and sweetener(s) while cauliflower is still warm. Add in heavy cream and puree until silky smooth. I just made this, tweaked a bit, but they came out delicious!! Used homemade almond yogurt instead of heavy cream, didn’t have liquid stevia, so used granular stevia instead, also used cacao power..came out really good..set up faster than 3 hours. I then whipped up aqua faba as my whipped cream….I now make eggplant brownies, faux apple cobbler w zucchini and now cauli mousse!! All delicious, healthy, low carb..REALLY AWESOME!! 🙂 Thanks, Lisa! Thanks so much for sharing! Love that you made it dairy-free. I’ve been craving pudding lately. This looks like the perfect solution! Hope you give it a try and it satisfies the craving. I read the comments about fresh compared to frozen. It’s edible but all I can taste is the cauliflower and avocado. I used coconut cream too & just truvia so I’m not gonna review the recipe since I apparently can’t follow directions. But wonder why frozen is so much better than fresh? Not sure, but it’s been said that frozen is usually better nutrition wise as it’s frozen right away and retains more of the flavor and nutrients. Heavy cream is the same as Whipping Cream? They are slightly different in fat content, but can be used interchangeably. Would it be possible to use half cauliflower and half avocado to up the healthy fat? Looks delicious, can’t wait to try! Avocado should work out and the chocolate should help mask some of the coconut flavor, but not all. The amount of cauliflower and the freshness does make a difference. I should probably add in the weight amount. I think Chia seeds instead of gelatin would work nicely. They should certainly work, but would give a little crunch. Admittedly, I was definitely skeptical about this recipe despite the fact that I have tried (and enjoyed )cauliflower as a sweet treat before. That recipe was a keto/low carb cinnamon/vanilla cauliflower rice pudding, and it was delicious, but it had enough strong ingredients in it that even the flavor of over-cooked Brussels sprouts would dhave been masked *grins*. 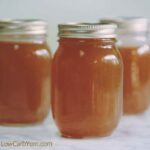 This recipe was delicious, fantastic and very easy…not too sweet but sweet enough for me personally. I used a head of cauliflower (just big enough to fit into my hands cupped around it), and I found the ingredient proportions just right. Having tasted this recipe would heavy whipping cream, I would advise against substituting anything else personally. 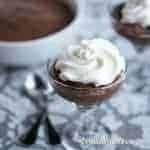 The combined flavor of the cream with the other ingredients gives this recipe a flavor very reminiscent of a clean-tasting milk-based chocolate pudding. Adding something like coconut cream will keep the richness of the heavy cream, but it will also throw the sweetness and flavor ratios off since coconut products have a distinctive sweetness and an almost floral note to them. If you must substitute, however, you must and I understand that. When I was first reading through this recipe and then making it, I was thinking “Hm…this seems like it needs something else…a dash of salt to brighten the sweetness…vanilla extra to enhance the chocolate flavor…” After tasking it out of the refrigerator…no…perfect as far as I am concerned. 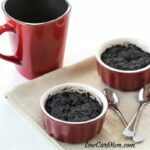 Thank you for providing such a great, easy, vegetable-containing dessert recipe! I look forward to trying your avocado pudding recipe soon. Thanks so much Rachel for taking the time to share your thoughts on the recipe. Would agar agar powder work? It should. It’s very similar to gelatin, but the amount may be a little different. It would be nice with a few fresh blueberries folded in? Or some grated orange zest? Orange zest sounds great. Not sure about blueberries, but it’s worth a try. Net carbs should be 3.3, not 3.1; subtracting sugars are not included, just total carbs and fiber; sounds like a great recipe, will try tomorrow. Thanks. I like using coconut cream. Although I’m turning 50 next week I’ve never tried cauliflower in my life! I’ve been scared, but since I had a pkg of TJ’s riced cauliflower I bit the bullet and made it this morning, let it sit until dinner. It did stink up the house for a while but all I can say is WOW! It is so creamy and smooth and airy, more like a mousse. 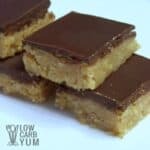 I WILL be making this again and again for a keto “treat”. Thank you! My husband complains about the smell every time I cook cauliflower. Not sure how to get rid of that other than to cover with diffusing essential oils. It should work. You may want to use a little less as almond milk is thinner. Could you add protein in lieu of the gelatin? The cauliflower is a pretty good thickener so it should work. 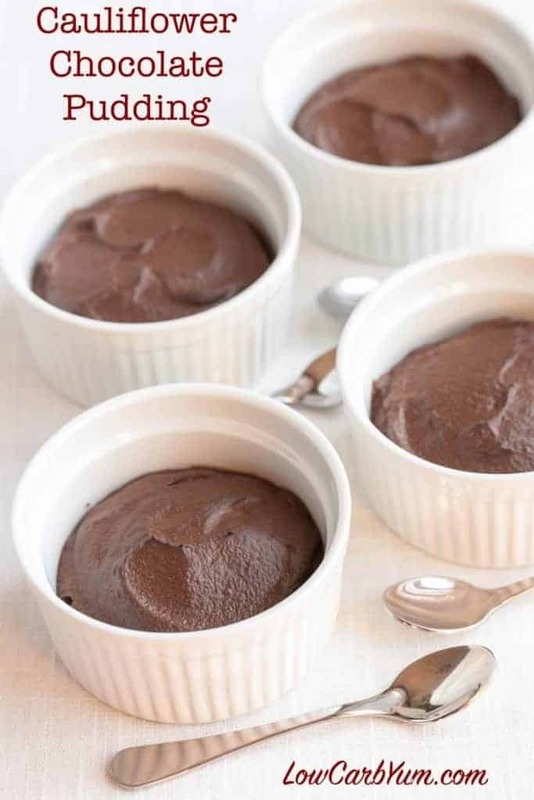 “My initial response was ‘no way’, but then I thought: ‘We make chocolate pudding out of tofu or avocado, so why not?” I intend to try it, but I need to wait until a day I’m in the house by myself. Husband is a good sport, but this might be more than he can wrap his head around. My husband had trouble with it too. He makes me open all the windows if I want to cook cauliflower as well. LOL. My husband hates when I cook cauliflower or broccoli due to the odor. Would it be okay to substitute heavy cream with coconut cream? if so, with what proportions? I would think so. Coconut cream is pretty thick so you might be able to omit the gelatin. I wonder how this would taste run through an ice cream maker? Before it gets too hard? Would it be like ice cream? I’m not sure. It would be an interesting experiment. I don’t see why not. You probably wouldn’t need any gelatin if freezing. Absolutely love this – today I added cream cheese and sugar-free chocolate chips – thinking it might make a good cheesecake – have you experimented with that? I’m going to give the cheesecake a try. Thanks for the idea! I have made something similar with tofu, but cauliflower is great. Question: Does the gelatin work because the cauliflower is hot? Usually you have to dissolve gelatin in some way. Am going to give this a try…. May reheat some mashed cauliflower I didn’t finish and see if I can make it work. Living alone, I never get through a whole recipe of something…. so this could be good, using half the cauliflower sweet, and half savory. The hot mashed cauliflower is what dissolves the gelatin. You could likely omit the gelatin. It really just used as a thickener. This is a good question. I would think the gelatin needs to bloom, so how about sprinkling it on the HWC and allowing it to stand till dissolved before stiffing up and mixing it in? Prior to steaming, how many grams of cauliflower is it? Fabulous idea, by the way! I used a small head of cauliflower. I need to get the exact weight and add it to the recipe. Apologize for asking a question that was already asked and answered..but I can’t wrap up my head around on how big (or small lol) is a small head of cauliflower. I see all sorts of sizes of cauliflower heads sold at the supermarkets and it would help if I can visualize the size you used in the recipe proportional to other ingredient. Thanks so much for sharing this recipe…something I really am looking forward to be making soon. I do agree that I need to provide a measurement. Mine was on the medium to small side so I’m guessing about 1.5-2 pounds. Can you make this using frozen cauliflower instead of fresh? Of course! You just need to cook it first. Congrats on the video! Being a novice myself I love ‘how-to’ videos just to track my technique with the pros like yourself… at least before I start experimenting. I have some sweetener questions: 1. is Stevia pure powder like the drops? I got it in bulk and now I’m not sure what to do with it, but want to use it whenever possible so need to know when would that be where you think it fits perfectly? 2. I bought Stevia peppermint. Now I want to put that in everything. Would it go here? Do you use it and if so where do you use it. BTW I ordered several things from Sukrin this week because I wanted to try out the bread and brown sugar (back ordered currently) and put in LOWCARBYUM and did indeed get 5% off my order. With the free shipping it was a lot more economical. Can you make this without gelatin? Is there something else?? Cauliflower is a natural thickener. Just wondering.. I think it would likely be okay, just not as thick. Konjac glucomannan is another low carb thickener that you could use if it’s too thin. What are the ingredients in the gelatin ? I use grass fed gelatin. It’s just gelatin from grass fed cows. You can read more about it here. It’s not essential to this recipe so you can leave it out if you’d like. do you mean leave out any gelatin or just leave out grass-fed? is any gelatin at all needed? what about using agar-agar. I use the gelatin to set it. You could try it without or sub with agar agar. 6.8g carbs per serving? Sorry, I don’t consider this low carb. Half of those carbs are fiber and most people don’t have insulin spikes with less than 10g total carbs. Well then you won’t be making it will you! Thanks! I thought is was really a nice way to eat veggies! I’m going to try this recipe ASAP. 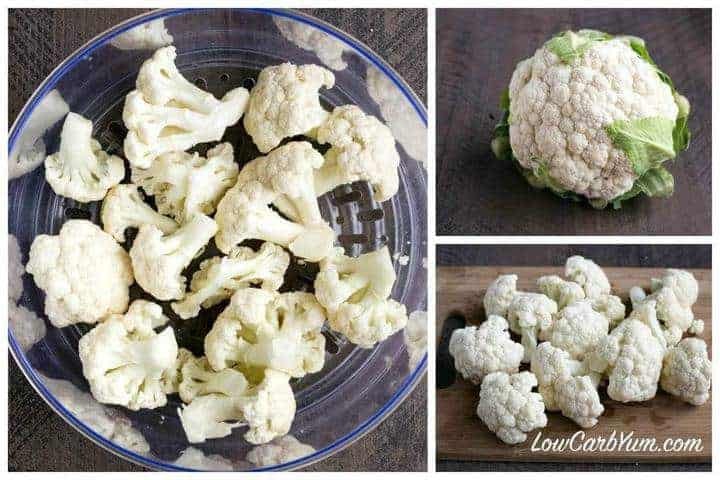 Great new way to use cauliflower! Just made the pudding. Had no stevia, so adjusted to taste. Very good. Can’t wait for it to firm up some. If I allowed myself, I could have eaten it all out of the food processor still warm. Enjoy! 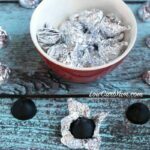 Wow, I need to watch my carbs so this is one fabulous way to get my chocolate fix! Yes it is Liz! Almost a guiltless treat! Haven’t tried them in smoothies, but I will soon. Thanks! Just made and out of the processor tastes great. Not sure what the right equivalent was but I used Truvia in place of the Swerve?? Now three hours before the final tasting. Serving to unsuspecting guests so will be interesting. I love that you’ll be serving to unsuspecting guests! I do that all the time. Sweetener amount is really to taste. I just added enough to my preference. I was able to get cauliflower at 47 cents a head at my local discount store. Can’t wait to try this. I was running out if ideas. You are so lucky. What a deal! this is seriously brilliant!!! I’ve got to try this! Thanks Alice! The taste really surprised me. Hi, this is intriguing me and I can’t wait to try it. I haven’t used gelatine before, do you add water to 1.5tsp of gelatine powder before mixing it in? Or do you just add 1.5tsp of gelatine powder straight to the mix? No need to dissolve the gelatin in water first as it’s being added to the hot cauliflower which had just been cooked. It dissolves in the puréed cauliflower because it is somewhat watery at that point. I have a beautiful fresh head of cauliflower and would love to make this. 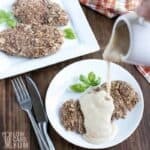 Can you tell me the sugar equivalent of the stevia in the recipe? I have a terrible aversion to stevia, so I’ll substitute other sweeteners for that. 20 drops of SweetLeaf stevia is equivalent to about 1 Tablespoon plus 2 teaspoons sugar. 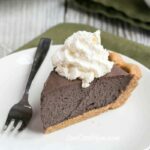 I will definitely give this a try 😀 not sure if it would be to my taste, but it’s really simple to do and we are in search of alternatives to the low carb cheesecake I usually make. I was a little skeptical at first, but I’m glad I gave it a try. I hope you feel the same way. I found it very filling as well. It’s a great way to sneak in a bit more vegetables too.